The Snowshoe Hare (Lepus americanus) is a “keystone” species. A keystone species is one that has a disproportionate effect on its environment relative to its abundance and thereby affects many other organisms in an ecosystem determining the types and numbers of other species in a community. It is analogous to the role of a keystone in an arch. While the keystone feels the least pressure of any of the stones in an arch, the arch still collapses without it. It is called varying hare because its pelage turns white in the winter. The litters of snowshoe hares are born precocial; born furry and active with their eyes open. The leverets (babies) are only in contact with their mothers for about 10 minutes a day to nurse and are weaned in 4 weeks. A female is capable of producing 3 to 4 litters during a summer. 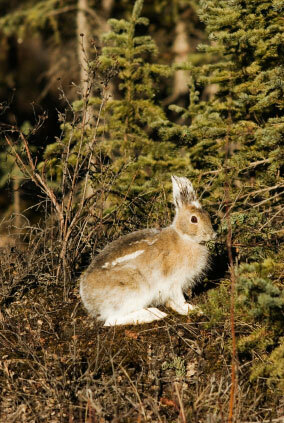 There is a well-established cycle of boom and bust for snowshoe hares which occurs on an average of 10 years. The hare peaks are followed by an inevitable crash directly affect the numbers of animals, particularly lynx, dependent on them as an important food source. Hares overeat their environment, particularly willows, which then respond to over-browsing by producing a chemical defense to repel the hares, thus inducing starvation and their cycle spirals downward. This is soon followed by decreased number of lynx, red fox, wolverine and birds of prey. Hares are 22 to 28 inches. The winter coat is long and the fur is white to the base. In the summer the coat is brown. The leverets are born in an unlined depression and weigh about 2 ounces and can walk by the time their fur is dry. They feed on willow shoots and dwarf arctic plants, grasses, buds, twigs and leaves in the summer and spruce twigs and needles, bark and buds of aspen and willow in the winter. The arctic hare is an important source of food and fur.